Stop worrying about missing your medication! 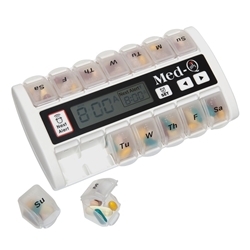 Easily program the Med-Q with a loved one or your medication time. It will flash the corresponding day slot with a bright red light and blast an alarm that increases in volume until you take your pills.